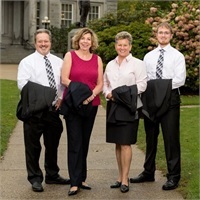 GLOBE WEALTH MANAGEMENT is a financial planning and wealth management firm located in historic downtown Concord, New Hampshire. The practice is comprised of two CERTIFIED FINANCIAL PLANNER’STM and a Financial Advisor. It is our goal to help you gain financial security, reduce unnecessary risk and give you an overall sense of control over your future. We do this by creating a sound financial plan focusing on properly organized account types and blending different investments to help maximize return and reduce risk. Once a plan is in place we review regularly with clients to make sure there are no life changes and then stay the course. With the ups and downs of the financial markets we feel that it is most important that an investor stay invested and stick with their long term vision. We utilize many investments within the strategies depending on the client’s goals, time horizon, investment history and what they will be using the invested funds for. Our team works closely with executives and retirees to help determine the best course of action for them regarding their specific benefits or retirement packages as well as current and future needs.